8:30am meeting at Parsley Boat Ramp, Brooklyn (on end of George Street, Brooklyn). Canoe to Bar Island (for lunch and a look around). Canoe to Doughboy Beach, and camp the night. Sunday morning canoe to Crosslands. Pack-up by 3pm. The International Pathfinder Camporee has SOLD OUT all tickets! Are you excited to see your local church youth ministry thrive? Register now and join us for some awesome workshops where you will be equipped and empowered to make real change in your church! The Plenary Session will explore the idea of becoming a Hero Maker, a person who ignites movement by investing in others. Teen Impact is an awesome afternoon program for teens and youth! It looks at some of the core issues teens struggle with like identity, and presents teens with some great ideas on how they can be the best version of themselves. Our speakers include: Pr Raul Moran, Pr Ryan Vidot, and Pr Phil Yates. After worship, there will be discussions, dinner and sports! DON’T MISS OUT! Please note that entry is free, though a $5 fee will cover the cost of a barbecue dinner. Also, all teens will need to be registered prior to entering the hall. Please bring your medicare, and other medical information in order to complete the registration form. Adventurer Fun Day is on again this year! Are you ready for a jam-packed day of fun, laughter and good times with God? ENTRY: 1 can of tinned food per person (This will go towards the annual ADRA tin food drive). To guarantee a food stall, please CLICK HERE and complete an application. Applications close 8am March 15! Please email them to lindaciric@adventist.org.au. Primary School Hall, Mountain View Adventist College. We will not accept any applications after 8 March 2019 (gives you time to complete the pre-reading). THE LEARNING PACKAGE WILL BE EMAILED ON THE 8TH OF MARCH 2018. Please join us for the 2019 Pathfinder Masterguide training day. We will be providing the resources and the training however participants must bring their own meals. $30 For resources, training, snacks and facility hire. This is a hands on training program for busy Pathfinder Leaders whether they have done PLA or not. It is a time of Professional Development, communication of the latest Pathfinder issues and conference programs and fellowship with other Pathfinder Staff. This program is for all Pathfinder staff to gain inspiration and encouragement in their ministry. Pathfinder Remix is designed to grow clubs in areas they need support and to help clubs come up with new ideas. This is why we have 2 sessions with different topics so clubs can choose which ones are most appropriate for them. Saturday February 9th from 3:00pm - 6:00pm. $30 for all provided Materials and Food. On February 2nd, 2019 at 2:00pm, we will be conducting our first training for the year for Adventurers. This is a great time for leaders and staff to come together and be equipped for leading Adventurer clubs. You will be able to network, share creative ideas and be in the running for special Seminar prizes. Saturday February 2nd, 2019 from 2:00pm - 6:00pm. Mountain View Adventist College 41 Doonside Road, Doonside 2767 NSW. The cost is $30 and will cover the resources you will receive on the day and for food. When Registering if it is saying 'Sold Out' please keep refreshing the web browser. This will happen when the website traffic is very high normally due to everyone registering at the same time. We are sorry for the inconvenience. We have looked for a different platform to run our online registrations however the most cost effective method for parents is to keep the same platform as fees can be as high as $25 more per child. Teen Camp has SOLD OUT! Please email gsc_youth@adventist.org.au to join the waiting list. Summer Camps are a great opportunity to minister for Jesus Christ in a fun and impactful way. Each application will be considered carefully. Appointed staff will be notified either via phone call or email during October and November. Applicants must be 16/17 years old for Junior Camp and 18 years old for Teen Camp. All staff are required to comply and conduct themselves to the standards of the Seventh-Day Adventist Church as well as all camp policies and procedures. Applications for new staff close on the 15th of October. For returning staff, applications close on the 29th of October. Staff who are accepted will be required to do some online training for Summer Camp and have a current Working with Children Number. Register today so that you can help make Summer Camp 2019 the best one yet! Summer Camp 2019 will be held at Crosslands Youth & Convention Centre. Dunamis is the Greek word for Power. it is mostly used to describe the power received by the Holy Spirit. This camp aims to assist young people to use this power in their lives and to help them to facilitate change in their lives. It is also a great way to build new relationships, to simply relax and also to reconnect with God. *This camp is for Young Adults that are over 18 years of age. All Pathfinders and their clubs are invited to the annual Pathfinder Rally for 2018. This is a time to reflect on what was an amazing year for many and a challenging year for most. We would love to see every club wearing their full parade uniform and being part of our Rally. The speaker for this year is Pr Raul Moran on the topic “Dusk to Dawn”. Would each club please send in 10 photos to be added to a highlight video for 2018 which will be played at the Rally. Youth Rally Heart 4 Service 2018 is the final youth rally of the year. 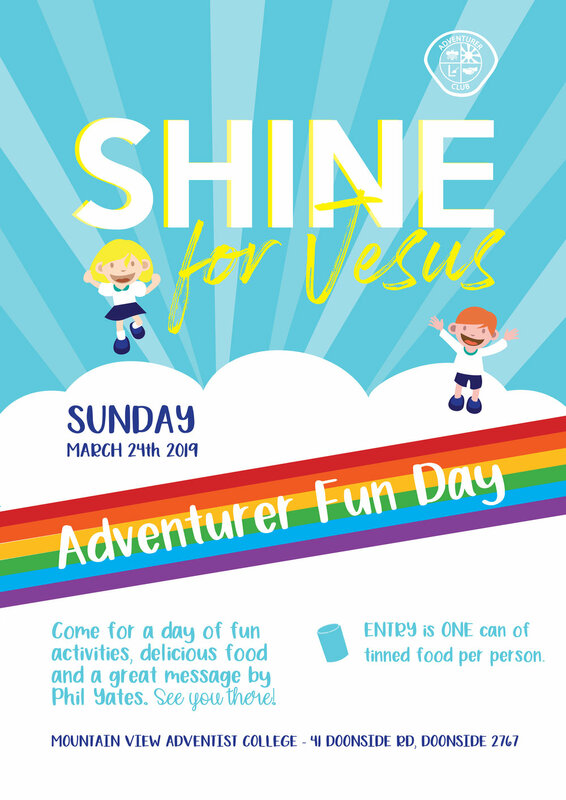 We invite to you to come along and be inspired to serve the community as Jesus served. Each different church will be organising their own unique service project. We hope that by doing this our chuches can be a beacon of hope in their respective communities. We ask all Youth Leaders to register their youth groups service project in advance so we can organise Heart4Service T-shirts for your group. When you register please tell us what you are doing, how many are participating and what shirt sizes you need. The 2018 Adventurer Camporee is being held at the Cataract Scout Park. This will be held during the 2nd - 4th of November. Covering the theme of 'Shout Out Loud' with special guest speaker Pr Willie Strickland (Director of Children, Adventurers and Pathfinder for South Queensland Conference). This event is for 4-9 year olds. Children aged 4 years and under attend for free. If you wish to bring a child aged 3 or under, you must send us an email. *All those attending must register (children and adults). MATES Conference exists to empower and equip men to live out God's purpose for their life. God wants men to be the best men, husbands, fathers and leaders in their sphere of influence. M.A.T.E.S stand for: Mentoring, Accountability, Teaching, Empowering, Equipping, Spirituality and Service. These values are what the Conference strives to help men develop and exemplify. Key Speakers: Pr Terry Johnson, Ian Howie and Pr Ray Moaga. 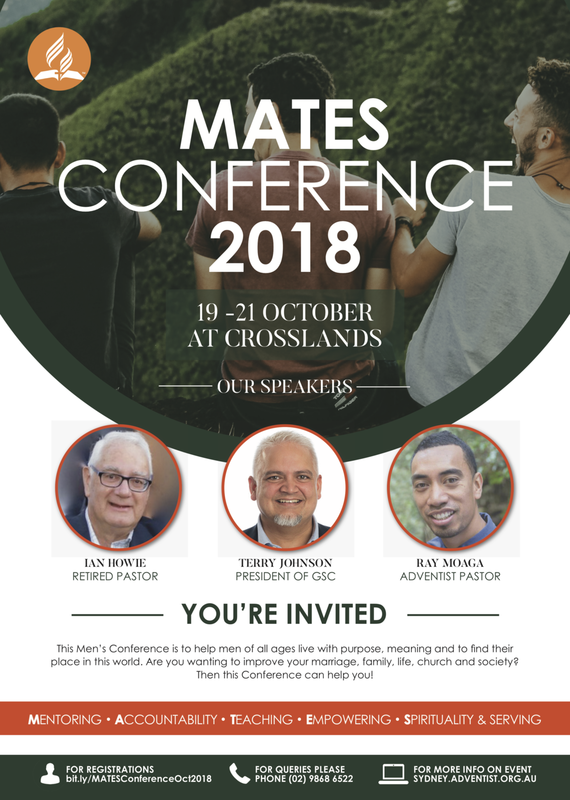 The MATES Conference will be held at Crosslands Youth Convention Centre. This year’s Pathfinder Expedition is in the Marramarra National Park. This is a place that has been involved with the history of both the Aboriginal and Colonial history. It has many challenging features to negotiate and natural wonders to appreciate. It is a great location to experience an Expedition, extend your friendship circle and to become excited about the power of our Saviour Jesus Christ. Register today so that your club can allocate you into a club group. These Pathfinder notes are for all Pathfinder Staff. Please share with all of your team. The walk will be staggered so as to spread the participants out at the beginning and the end. Please obey the marshals (DD’s) The walk will proceed up the steps, across the Harbour Bridge, up Macquarie St until the State Library. Then walk through the Domain and end up on the lawns opposite the NSW Art Gallery. This is where everyone will receive their patch and then disperse with their club. We will have Adventurer or Pathfinder DD’s along the route. - Wear the Pathfinder Uniform. - Those with breathing difficulties MUST bring their medication. - Umbrellas or wet weather gear due to the possible weather. Showers are currently forecast so the event will be on. - Participate in the introduction activity. This is more than just a walk across the bridge. This is also a commitment to a lifestyle. - Start when requested. Walk no more than two abreast. - Please do not linger on the walk or at the end. Make POSTERS that talk about ‘SAY NO TO DRUGS’ – No bigger than an A3 size of paper (Be creative). PLA 3 is the final PLA training program for 2018. PLA 3 Sabbath & Sunday training days features all of the five Australian National Outdoor Recreation Units that are listed in the PLA Curriculum. Our RTO is Avondale College. Then we also have one final Pathfinder Unit (PTHOP002 Pathfinder Active Learning Methods) to complete. Mentoring and nurturing young women & men to reach their God ordained potential. Acknowledging self-worth, valuing sound choices, building confidence & developing character. The single-track mountain bike trail is a combination of narrow bushland trails and flowing one-metre-wide trails. Whether you’re looking for a technical ride or simply want to release the brakes along the flow trail, you’re bound to find it. At the bottom of the fire trail there is a green loop that can be safely ridden by beginners. From there it is possible to build up through the various levels until you’re an expert. For clubs/individuals that do not have adult supervision we will have groups leaving at 9:15am under the supervision of an adult for the beginner & intermediate track. After completing these you will have an option to attempt the advanced track. Shred It is on again for 2018 held during the first weekend of August. Hosted by SNSW and the GSC Conference, we wish to extend an invitation to everyone all around Australia. Shred It for those who don't know what it is, is a camp held at the Adventist Alpine Village where you get to ski or snowboard by day, and worship and hang out by night. This year we will have guest speaker Josh Carnie from Melbourne and is now studying Theology at Avondale College. SHOUT TO THE LORD Adventurer Rally. Are you a youth leader or volunteer in your church? What is your local church doing in the youth and young adult space of your church? This program is all about sharing your ideas and listening to other ideas on how to make an impact on our youth and young adults in our church. 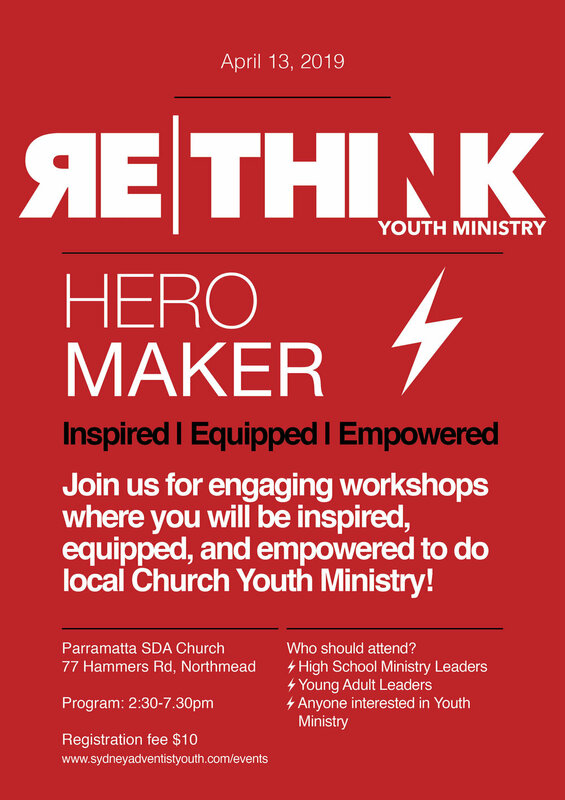 We encourage all youth volunteers, workers and leaders to come along and empower each other to make an impact on the youth of Sydney! 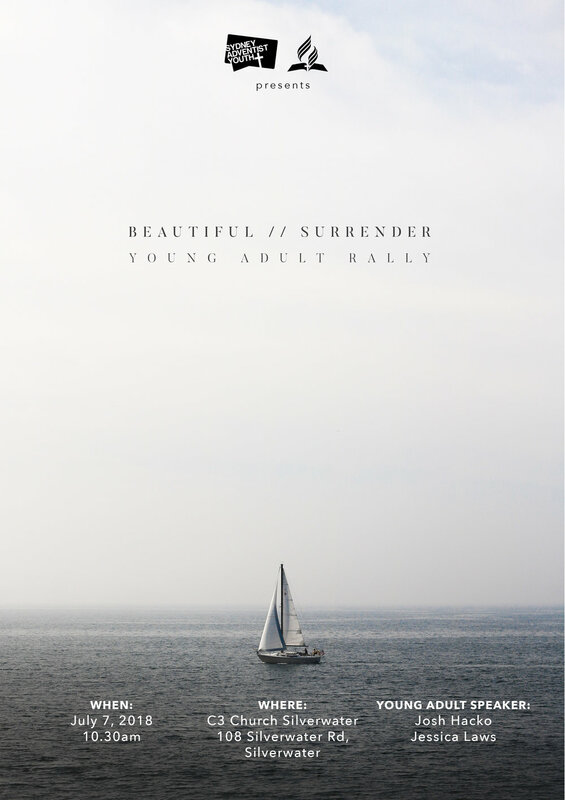 If you are a student, young working professional or a young married couple, we encourage you to come along to 'Beautiful Surrender' young adult rally. Young adult rally will be held at the amazing C3 Church in Silverwater and we will have two of our very own young adults talk to us: Josh Hacko and Jess Laws. On June 30, 2018, we will be conducting our second training for the year for Adventurers. This is a great time for leaders and staff to come together and be equipped for leading Adventurer clubs. You will be able to network, share creative ideas and be in the running for special Seminar prizes. The cost is $17 and will cover the resources you will receive on the day. The venue is at the GSC Conference Office at 4 Cambridge St, Epping 2121. PURPOSE – to provide an opportunity to learn map and compass skills through experience. This event is designed for beginner groups (that will appreciate a guide) and experienced group to continue to develop their skills. LOCATION – The Western Sydney Parklands Cecil Hills area. This is a great area to gain experience in identifying the shape of the land from what the map says and what you see. This year’s activity is in the southern and central area of this location. It have lots of rolling hills with some great lookout spots. It is an excellent location to learn and to continue to develop your skills. We were last in this area in 2015. Access to Dobroyd Drive, Elizabeth Hills is of Cowpasture Road. There are two ways of accessing the location. ASSEMBLY LOCATION - We will assemble on the grass close to 3 Dobroyd Drive. The HQ and Portaloo Toilet will be at this location of before you cross over the M7 pedestrian bridge. This is a public place and you will need to find parking on the streets in the area. COST – $11 per person when you register on line. - The cost includes, hire of portaloo, map and other stationary for the event. WHAT TO BRING – Individuals: long pants, covered shoes, long sleeved shirts, wind break (clothes appropriate to the weather), hat, day pack, lunch, snacks, water and a compass. Groups – at least ONE mobile phone, basic first aid kit, hand radio, toilet paper and hand trowel in case of emergency. Control card, control point description and a program that includes the safety guidelines. We will also make available experienced guides to help your group to read a map, use a compass and knowledge in how to navigate in the bush. Intermediate and Basic abseiling is on again this June! Basic is especially designed for beginners. The honour includes basic safety awareness, basic abseiling skills and complete at least 5 abseils. It includes a review of skills learnt. It will finish up at around 2-3pm. Intermediate is for the person that has complete basic and wants to learn advanced abseiling skills, using a wide range of devices, tie specific knots and demonstrate the ability to ascend up a rope using a Prussic knot. Training will finish later than basic. LOCATION: Crosslands Property. Drive as if going to Crosslands Convention Centre, but do not go down the windy road. The abseiling location is at the lookout on top of the cliffs. Park at the top John Wells will be present and will provide you with equipment and show you were to go. STAFFING: All staff have current Australian qualifications in Abseiling or are in the process of gaining them. All equipment meets National safety standards. All staff have WWCC. All staff are volunteers who love sharing this experience with others. All are members of Adventist Outdoors Sydney (AO Sydney). WHAT TO BRING: Lunch, water, hat, enclosed shoes, shorts, shirt and something warm. WHO: Anyone over 12 years of age. Abseiling is limited to the first 25 people. Applications close on the 1st of June.